The Quotidien knife series is a separate extension of the kai Michel BRAS collection. 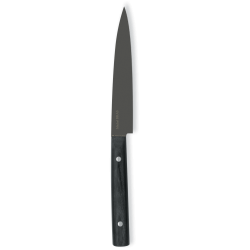 As the name Quotidien (French for "everyday") suggests, these knives are designed for daily use in the kitchen. The series consists of three different knife sizes with titanium-coated all-purpose blades, which are characterised by consistent functionality and sharpness as well as robust material quality. Due to their light weight, they are particularly easy to handle. Paring knife Quotidien. Small and useful paring knife.Blade: 7,8 cmHandle: 9,8 cm..
Utility knife Quotidien. Multifunctional and useful utility knife.Blade: 12,1 cmHandle: 10,6 cm..
Utility knife Quotidien. Multifunctional and useful utility knife.Blade: 15 cmHandle: 12,3 cm..